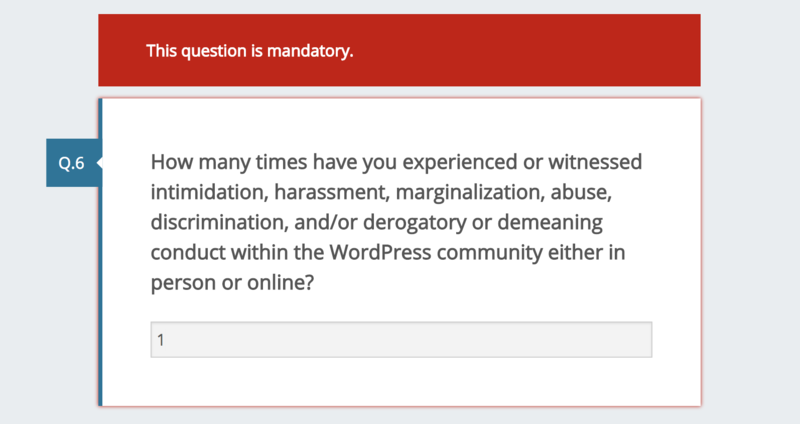 Disappointing that the survey does not touch on ageism nor collect a demographic for that, which shows the limits of Inclusion in the WordPress Community. You should respect elders, who have volunteered on Open Source projects for decades, paving the way for you. @skarjune I’m sorry that you feel like this survey is overlooking you. Believe me, I am well aware of the problem of ageism in tech. However, the point of this survey is simply to determine where our community thinks the Code of Conduct should apply/be enforced. This survey is not trying to determine what groups need to be protected by the CoC. Notice that the survey also did not ask any questions about race. This survey is just one early baby step in a long process: when we get around to crafting the CoC and detailing how it will be enforced, we will make sure that we think about what types of harassment need to be covered by the CoC. Why then is only gender extensively addressed? Is race and age not a concern for Inclusion? I apologize, as I should not toss out rhetorical questions. What I want to say is that I’ve learned to practice Inclusion working at WordCamps with the Code of Conduct defining the principle as “regardless of gender, age, sexual orientation, disability, physical appearance, body size, race, or religion.” So, in addition to the gender demographic question in the survey, it might have been helpful to somehow include all such factors to get a sense of how respondents identity or where they have concerns (mine is ageism). We know this is a serious matter, and the WordPress Community can and does make a difference. All people everywhere do matter in our community and all communities. Thanks! All people everywhere do matter in our community and all communities. I could not agree more, which is why we are doing this. Our team had many long discussions about what demographic data to collect in this survey, and even whether to collect demographics at all. It is really complicated by the fact that the survey is international. Asking about race gets really complex in an international survey, because different cultures define race differently, and some races are obviously minorities in one country but majorities in another. Demographic questions are also tricky because they rely on people self-reporting, which they don’t always do accurately. We even talked to someone who designs surveys for a living to get her help with our demographic questions. But again, the purpose of this survey is to determine how much support there is for a community-wide CoC, and where people think that CoC should apply. Thank you for your feedback. I am not trying to be dismissive of your concerns, and ageism is a concern of mine as well. We will take this into account as we design the Code of Conduct. Shouldn’t the above be included on the survey front page? FWIW, I want to answer this with something like “a handful of times,” because… a specific number feels very exact. I don’t know specifically how many times, but it’s forcing me to choose a number, which is very uncomfortable from an “I want to be accurate” standpoint. I had the same feeling on that question – it’s really tough to nail down a specific number for this kind of thing. It would probably be better not as an open answer field, but some kind of intervals, for example: never, once, 2-5 (or whatever is logical for comparison), more than X.
Morgan, I have to ask. 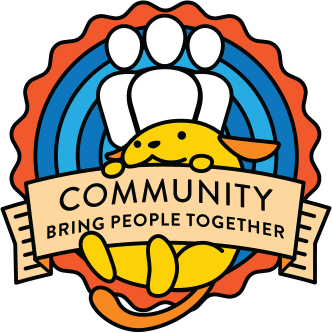 As someone who was discriminated against by certain members of the WordPress community as well as Automattic which both turned a blind eye to those reports, how many members on your committee are in the same position? I’m deeply troubled that this “Code of Conduct” will just be for the public side of things while complaints will be continued to be followed up with server DDoSing and threats of violence and legal actions. I am so sorry that you have been the victim of discrimination, and even more sorry that your reports were not taken seriously and that you have had to deal with retaliation. To the best of my knowledge, none of the people on the Code of Conduct committee have submitted harassment reports that have been ignored, but I can’t speak for everyone. You are welcome to join our committee if you want, although I certainly understand if you don’t have the time for it or you would find it triggering. I take Codes of Conduct VERY seriously. I have been the victim of harassment in other spaces, and I strongly believe in a zero-tolerance policy for harassment. I know that the other people on our committee also take this very seriously. After we determine where the CoC is going to apply, and after we make sure we are happy with the text of the CoC, we are going to devote a lot of time to coming up with an enforcement process that is safe, fair, and effective. I don’t ever want to hear another person say that their report was not taken seriously. This project is not a publicity stunt, and this is not about lip service. We are truly dedicated to having an effective Code of Conduct that actually works and actually keeps members of our community safe. I have given a lot of thought to this, and at the end of this process, if I don’t think this is an effective Code of Conduct, I am going to quit all of the extensive WordPress community work that I do. Please feel free to reach out to me on WordPress community Slack (@morgankay) or send an email to report@wordcamp.org or fill out this incident report form: https://central.wordcamp.org/incident-report/ Even if the event was years ago, it is not too late to report both the original harassment and the backlash, and we can make sure the appropriate actions are taken. Thanks, @netweb, @melchoyce, @hlashbrooke, and @alvarogois for your feedback! Unfortunately, we can’t change the survey after people have answered it because it will invalidate our results. We did post the survey a few weeks ago to ask for feedback on it – that would have been the time to suggest changes to the survey. Unfortunately I don’t follow this p2, so I only saw the survey when it was mentioned elsewhere. Maybe things like this could get x-posted? I should have posted it on the CoC trac ticket – we will do that from now on when we need feedback or report important milestones. Sorry @gwendydd, I’m a WordCamp and meetup organizer and didn’t get it. I followed the link to this post mentioned in WP Tavern, I believe. The changes I suggested would be added to the landing page of the survey, no changes to the survey questions would be required, the updated text would better reflect the goals of the this Code of Conduct survey as far as I understand them. I was wondering if you are planning to publish the results of this survey ? This data would be a considerable resource to help us work on the issues the survey brought up, such as gender/sexuel harassement in the WordPress community. It would really help us (WordCamp and meetup organizers, and as a comunity in general) to have solid data that cannot be refuted. Yes, we are going to publish the results! We’re still working on anonymizing the results so that we can release them to the public. We hope to have this done soon. Thanks for following up! Just doing a 6-month check-in to see if the CoC document has been created and where it can be found. Thanks!